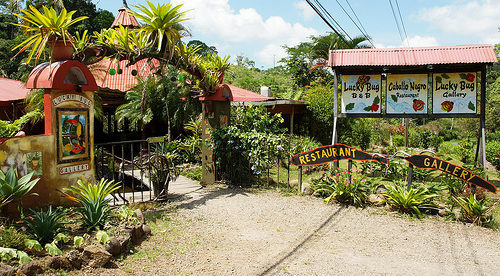 In Costa Rica, most Ticos involved in the tourism industry speak English. Una más cerveza por favor: One more beer, please. Dónde está el baño? : Where is the bathroom? Most Costa Ricans, or Ticos, involved in the tourism industry speak English. For anything more than a hello, or a request for beer or the bathroom, I was able to communicate in English. It’s not that I didn’t try to communicate in Spanish. I actually had a combined total of seven years of it throughout grade school and University. Unfortunately, as I soon discovered, learning hundreds of extraneous vocabulary words, various verb tense lessons and conjugation exercises did absolutely nothing to aid in my attempts to effectively communicate in the Spanish language. On top of being unable to string together a sentence, I realized that a lot of the Mexican or Spanish vocabulary words I had learned in school were inapplicable in Costa Rica anyway. For example, I tried once to compliment a friend on her car and told her in perfect Spanish, “Me gusta su coche.” She asked me to repeat myself a few times and with gesturing I was able to get the point across. But she still looked at me like I was crazy. What I didn’t know was that “Me gusta su coche” means “I like your cart” in Costa Rica, not “I like your car.” I had just insulted her by comparing her car to a grocery cart. I later learned that the more acceptable and natural phrase would have been “Que lindo su carro” (literally, “How nice your car”). After several miscommunications, I knew the first and most important thing I needed to do was to learn Spanish, again, once I moved full-time to Costa Rica. I enrolled in an intensive course at a well-known and well-established institute in Costa Rica. It took three months of going to school for eight hours a day, five days a week to complete the course and receive certification. Outside of school, I practiced Spanish with the non-English speaking family that I lived with. Levels of education varied among the family members and it was with this family that I learned some of the most valuable lessons in communicating. The combination of a formal education and conversations with non-English speakers has been a very rewarding and effective method for learning Spanish. After three years, I’m still learning—and still making amusing mistakes—and am looking forward to learning even more.